This time, I will show you some simple guitar wiring. It doesn't have any volume and tone control. It will be great, if you prefer to use only pedals for this things. The only control in this guitar circuit is a load pot. It can be used for adding a little bit of warmth/smoothness to the guitar tone, or as a stand-by switch. 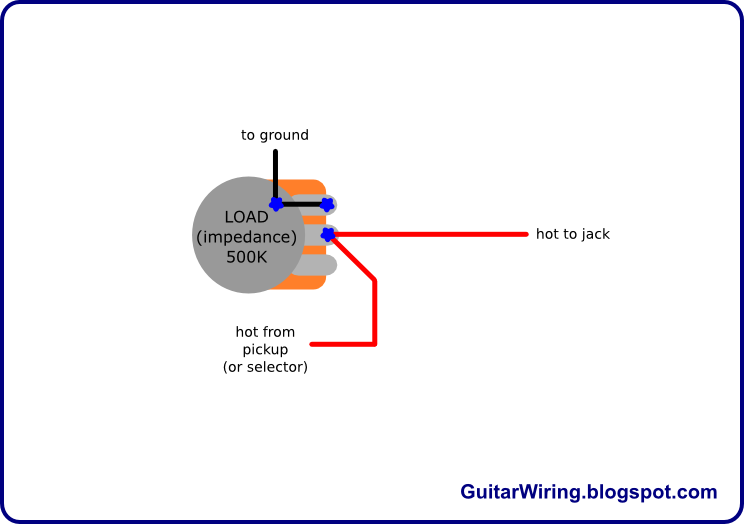 The pot resistance in connection with the pickup and the ground can muffle some amount of guitar's treble, or even middle frequencies - if you will turn it down quite much. If you have some experience with changing guitar pots with different values, you know, that a lower value means less treble in the signal. The same thing will happen, if you will turn down the knob of this wiring. There will be smaller impedance caused by the pot, but the guitar volume will not be decreased so much, like with the common volume control. It's basically a much better tone shaping tool, than a typical tone control, if you like to warming the sound gently, without losing wide frequency response. If you will turn down the knob to 0, you will kill the signal. It will happen because of the impedance value close to 0 – between the guitar wiring hot path and the ground. This is an another good thing here. You can use the knob as a stand-by switch. This wiring have some great thing that every passive, potentiometer based guitar wiring usually got – it's the pot load. In my design, you can regulate it. You can decide how warm or smooth your guitar tone will be. The wiring is also very simple and easy to use. It will work great with any volume and tone control pedals.